"Citizens of Vallejo, while I cannot be with you, I am proud to participate in this way in these unique and historic ceremonies. With this new Polaris submarine, we honor a great American hero. Like so many of your nation's heroes, his is a name of Mexican ancestry. As a soldier and as a statesman, General Vallejo was one of the first of the long line of courageous Mexican-Americans who have fought so bravely for freedom and worked so tirelessly for peace. In honoring him, we also honor the citizens of your city which bears his name. For 110 years, you have built 500 vessels to fulfill the Mare Island slogan, "Our Sole Mission Is To Serve The Fleet." I am sure that in building the Vallejo you will surpass all your own past records. We today live in peace with our good neighbor and friend, the Republic of Mexico. We of America work for a world in which all men of all lands may live side by side without fear, without suspicion, without war. To that goal we dedicate this vessel now." The podium in place for the Launch Ceremony. The 658 was launched from the ways on 23 October 1965. The City of Vallejo put on a party to remember. The shipyard workers had built an FBM of extraordinary preportions. 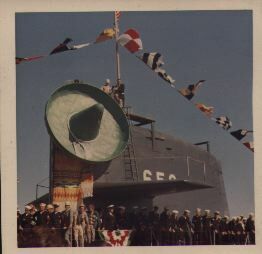 For many years to follow experienced submariners would board her for the first time and take note of the many "extra features" that were installed. The chrome, brass, paneling and flooring were only a few of the options not found in the 41 for Freedom fleet. The craftsmanship of the shipyard workers was flawless and she performed as expected. The 658 wears a Sombrero for the festivities. 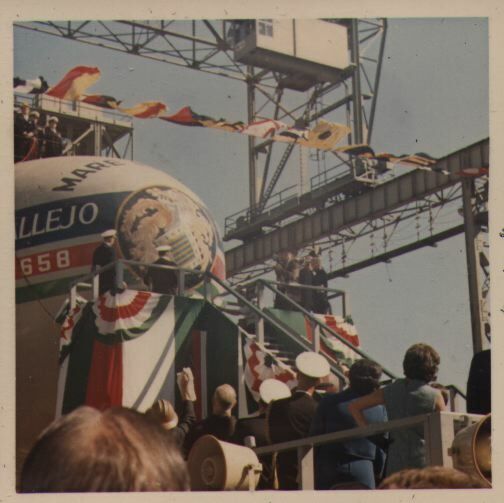 After the parades, the performances, and the speeches the 658 was christened by her sponsor, Patricia O. V. McGettigan; great-great-granddaughter of General Vallejo. The champagne burst across her bow and sent her onto her shakedown to ready her for 30 years of impeccable service for the United States Navy. 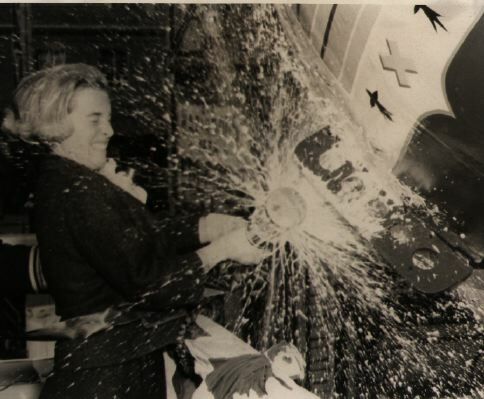 Patricia McGettigan christens the ship. The following list is the operational history of the 658 that is on file with the Navy Archives. 12 Apr 1974 Gold crew successfully launched one POSEIDON (C3) missile in support of the shipís Demonstration and Shakedown Operation. 12 Jul 1974 Deployed for operational patrol following POSEIDON (C3) conversion. 22 Nov 1974 Gold crew successfully launched four POSEIDON (C3) missiles in the eighth Operational Test (OT). 21 May 1978 Blue Crew successfully launched four POSEIDON (C3) missiles during a Follow-on Operation Test (FOT). 8 Jun 1979 Departed on patrol following completion of the last SSBN upkeep at Rota, Spain. 5 Nov 1979 Completed industrial phase of conversion to TRIDENT I (C4) missile capability. 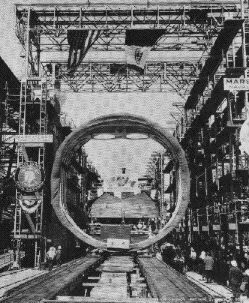 7 Sep 1979 Commenced part I of the industrial phase of the TRIDENT I (C4) Backfit Program at the FBM Support Site in Charleston, SC. Second SSBN to be backfit pierside. 13 Dec 1979 Gold crew successfully launched one TRIDENT I (C4) missile in support of the ships Demonstration and Shakedown Operation. 4 Feb 1980 Deployed for operational patrol, following pierside conversion TRIDENT I (C4) conversion. 2 Apr 1980 Blue crew successfully launched four TRIDENT I (C4) missiles during an Operational Test (OT). 27 Jun 1980 Gold crew successfully launched four TRIDENT I (C4) missiles during an Operational Test (OT). 17 Mar 1982 Gold crew successfully launched four TRIDENT I (C4) missiles during an Operational Test (OT). 3 Jan 1983 Commenced refueling overhaul at Charleston Naval Shipyard, Charleston, SC. 9 Jul 1984 Completed refueling overhaul at Charleston Naval Shipyard, Charleston, SC. 9 Oct 1984 Gold crew successfully launched one TRIDENT I (C4) missile in support of the shipís Demonstration and Shakedown Operation. 9 Nov 1984 Deployed for operation patrol following refueling overhaul. 2 Apr 1987 Arrival at Naval Submarine Base, Kings Bay, GA marked the completion of the 2500th FBM deterrent patrol. 15 Apr 1988 Successfully launched four missiles in support of the 30th TRIDENT I (C4) Follow-on Operational Test (FOT). 10 May 1991 Gold crew successfully launched two TRIDENT I (C4) missiles in support of the Follow-on CINC Evaluation Test. The test was conducted on the Eastern Test Range off Cape Canaveral, FL. 27 May 1994 Decommissioned, Charleston, SC.